“I still believe in a place called ‘Hope,'” said the last president named Clinton. I still believe in that place as well, although I don’t find it in the political circus or any of the performers in that ring, even Hillary. But I don’t blame politics for that. I just blame what we have let the meaning of that word become. Total. Complex. Relations. Between people. Living. In society. It’s what has been modeled for me in the body of Christ – the church – a place that has struggled with politics since its birthday two thousand years ago, and yet still walks on, humbly and imperfectly. With hope. Its totality: global, existing in its varied parts across the whole planet. I have walked with my brothers and sisters – the eyes and ears and limbs I cannot get along without – in Cameroon, the Czech Republic, Germany, Iraq, Lebanon, Syria. It’s a big family! It’s complex: orthodox, catholic, reformed, apostolic, evangelical, monotheistic but based on a trinitarian dance of Father, Son and Holy Spirit. It’s relational: in worship, in creeds, in sacrament – sharing life together with the one who gives us life. Between people: and among people! Caring for each other in crisis. Praying at the bedside of the dying. Feeding the hungry. Standing with the oppressed and imprisoned. Seeing the value of our human lives as our created made us. High and low, young and old, male and female. Between. Among. Connected. It’s living: ISIS can’t destroy it (although it is trying); purveyors of the prosperity gospel can’t dilute it and sell it like indulgences (although they try). Its message of the real good news – death is defeated! – puts air in our lungs. In society: I have seen it care for the least of these in a home for the handicapped in Ludwigsburg, Germany. I have it walked with it among Syrian refugees in camps in Lebanon. I have heard it shouted from displaced Iraqis now in Kurdistan: we may have lost everything, but we still have Jesus! It will not be silenced. It is in the public square and ministering there. And that is where I find hope in politics. Not in the mud-slinging that is to come as we sort out who our leaders should be, but there in that buried fifth definition from Merriam-Webster. 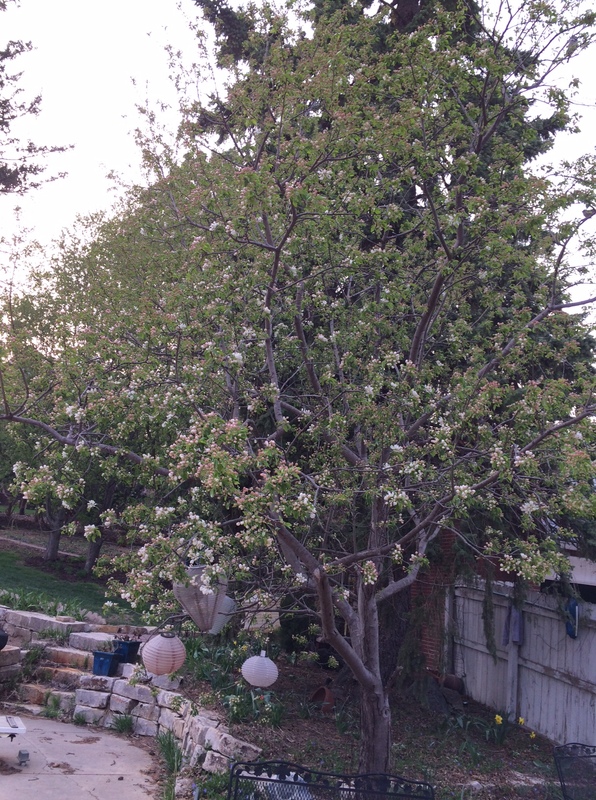 I find hope in that crabapple tree on our back patio. It’s roots are bound by concrete on all but one side, and yet every year it pushes out those gorgeous pink blossoms which will fall like snow in a week. The blossoms will wither and descend. The tree will hibernate in the fall. And then…BAM! Here they are again. John 1:14 says the word was made flesh and pitched its tent with us. The complex totality of the word of God moved into the neighborhood, into our society, to live with us. And hope is here still. Thanks for the reminder… Hope, like Love, Trumps!